Last night the sixth Marshall-sponsored Classic Rock Roll Of Honour awards paid homage to rock's finest with a star-studded ceremony at the Camden Roundhouse. A suited and booted MusicRadar was lucky enough to be attendance at what turned out to be an emotional and - with a little help from Master Of Ceremonies Alice Cooper and live performances from ex-Thunder guitarist Luke Morley's band The Union, Alter Bridge (pictured below) featuring Slash and Cheap Trick - suitably loud event. 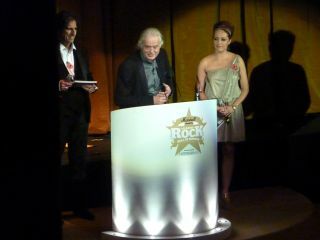 Ronnie James Dio's widow Wendy picked up the late legend's Tommy Vance Inspiration award with a touching acceptance speech while John Paul Jones dedicated his Outstanding Contribution gong to the other half of rock's greatest rhythm section John Bonham - a sentiment which easily roused the loudest applaud of the evening. Tony Iommi (pictured below) also presented his long-standing band mate Geezer Butler with the Metal Guru award - you get the picture, you could pretty much cut the love in the room with a knife there was so much of it. Perhaps the most puzzling winner of the night was the Event Of The Year. Not Download, not Sonisphere, not even Classic Rock's very own High Voltage festival - the award went to Journey's Don't Stop Believin'. A song which has plagued airwaves and pop culture thanks to Joe McElderry's 2009 X Factor performance, that Glee cover and since featuring on the very last scene from The Sopranos. Watch a beleaguered John Paul Jones trying to answer which version he prefers courtesy of the BBC (clue: it's not the Glee version). And gear nerds will be pleased/jealous to know that we were treated to a first glance and listen to Slash's Marshall AFD100 amp head (the prototype which is on it's way to Guitarist magazine for the full review treatment as we type). Check out Classic Rock for a full breakdown of the night's events and click 'next' for the full list of winners.